India is a large, multi-ethnic, complex civilization. Its earliest culture 5,000 years ago by the Indus River was amazingly sophisticated with planned cities, sewage systems and other creations that were the most advanced of its time. It suddenly disappeared 4,000 years ago, to be replaced by a civilization from the Aryan invasion. Its current religion, culture, caste system, and everyday life stem from that Aryan invasion. 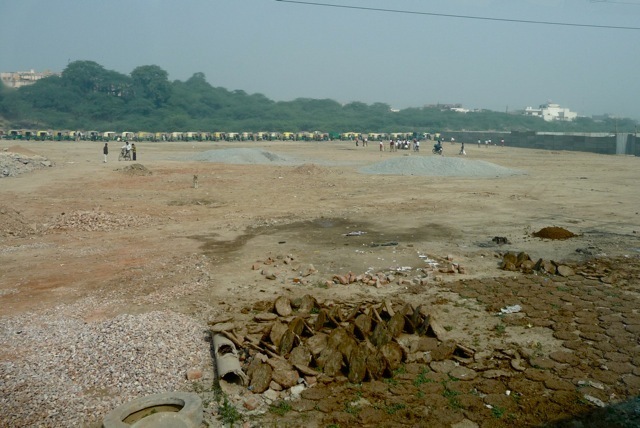 I cannot claim to understand this complex society in a 6-day tour, I can only show what I observed. 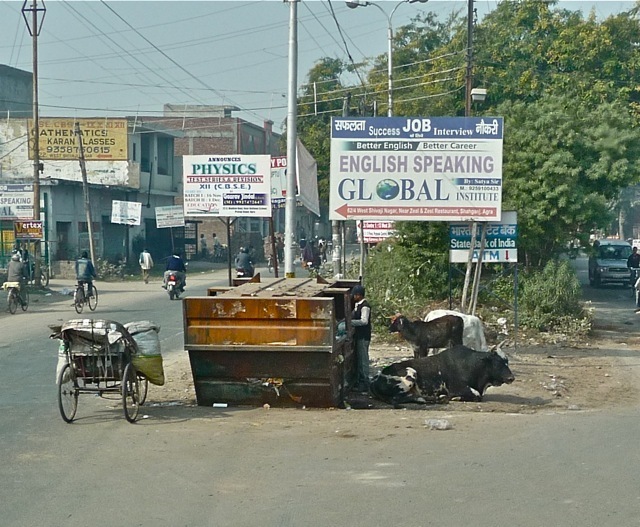 India is a developing country with large population of poor people, and street scenes are mostly occupied by them. The rich and the middle class are not as visible. As a tourist, I see mostly the lives of the general population. Indians eat lunch bought from stores that serve fried dough with curry sauce. They eat standing up since shops do not provide seats for such inexpensive purchases. 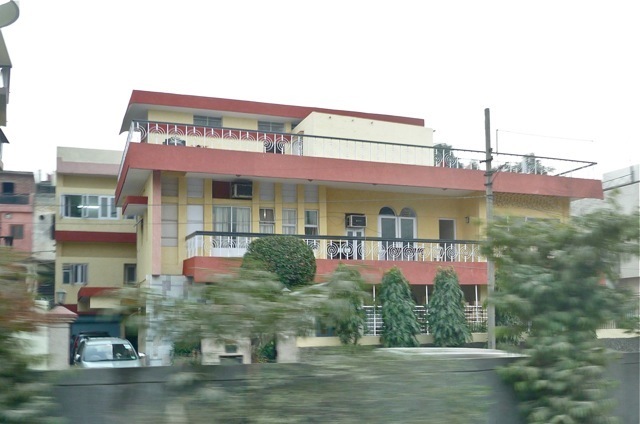 McDonald’s have stores in India, but its relatively expensive prices keep it a middle class preserve. 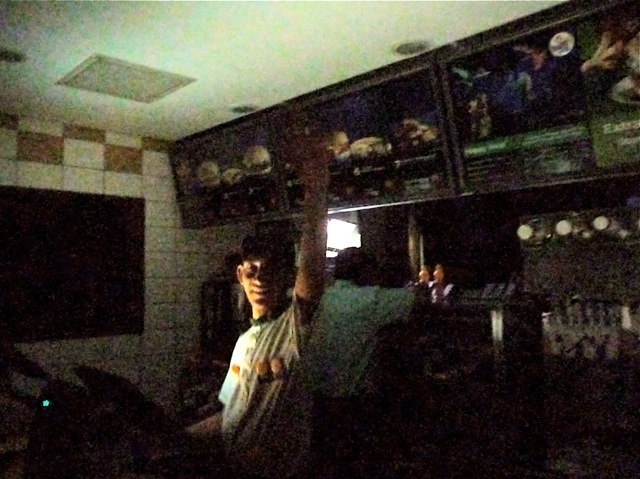 The electricity of this store went out as I was purchasing its Chicken Maharaja Burger, and the clerk stopped me from taking picture of the store interior. Cows are considered sacred in the Hindu religion. 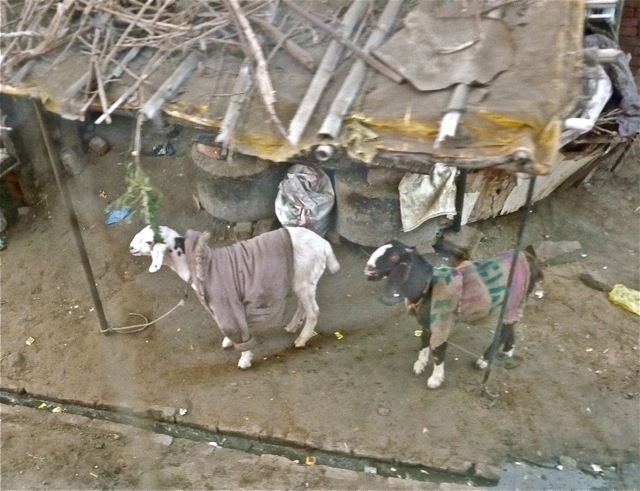 These two were so comfortable with city life they placidly stood on an island as heavy traffic zipped by them. They had their eyes closed, seemingly in meditation of their past incarnation. 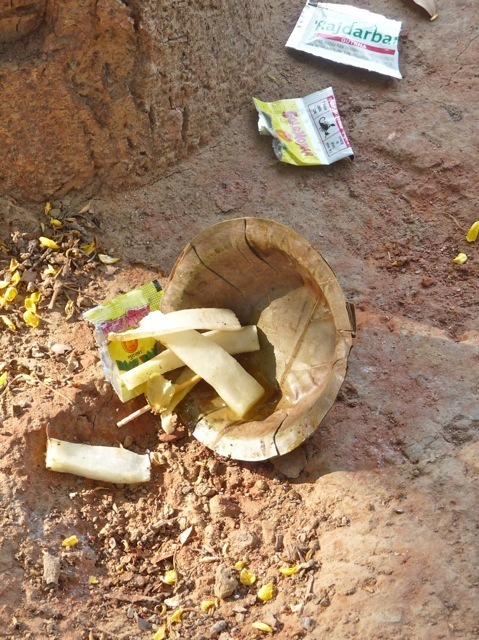 The cows live by scavenging what they can on the streets. These cows and a calf rested near a garbage bin, probably after having their fill of the discards. A poor man was scavenging through the same bin, but was seeking recyclable bottles instead of vegetations. 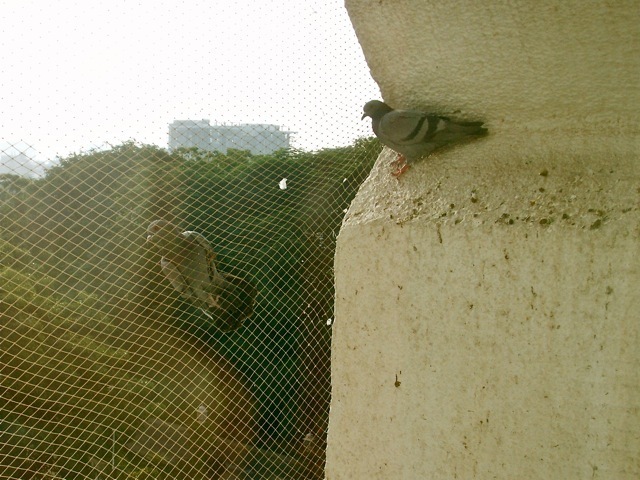 Our hotel wrapped itself with a netting to keep pigeons from resting on its exterior and fouling the walls. A pigeon found its way into the net but could not find its way out. A friend came by to visit this condemned prisoner who would eventually starve to death. These sheep were dressed in human clothing. I don’t know if it was a joke played by their owner, or an act of charity to keep them warm. 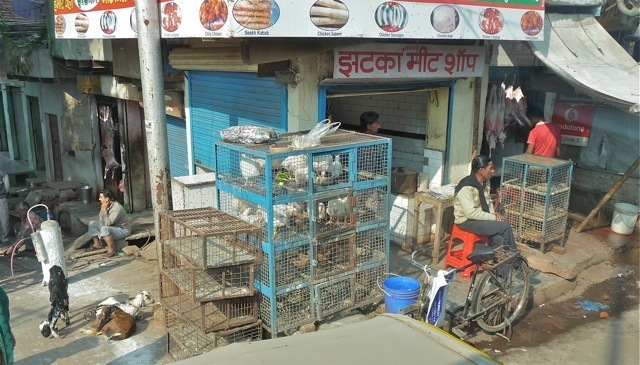 Most Indians are vegetarian and the market place serve their need. 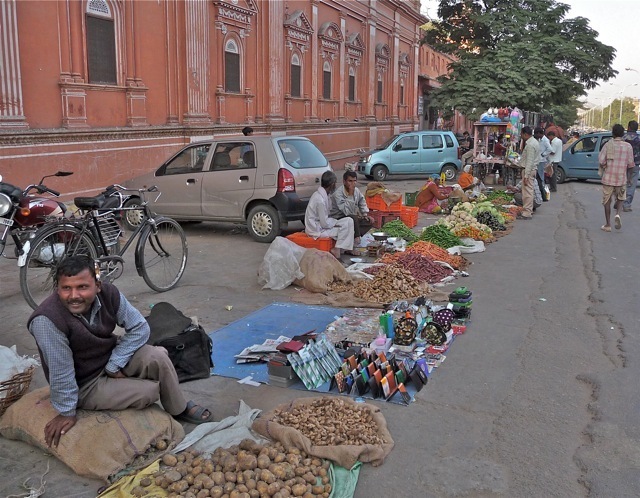 Vendors sold vegetables, fruits, beans, grains, and spices. A corner of the market served the carnivores. Two sheep were tied to a post, to be butchered when a customer warranted it. That would be really fresh meat. The table behind the man on the stool was covered with a thick layer of buzzing flies. 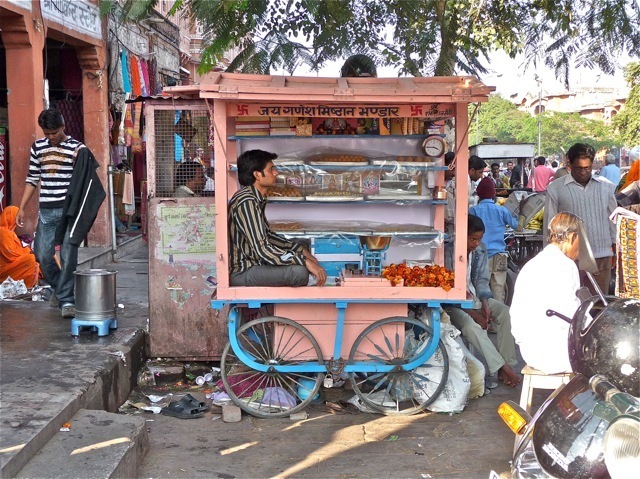 Many vendors sold a few items on four-wheeled carts and they would sit in the cart cross legged. This vendor seemed to be meditating. Poverty was stark and in-your-face. 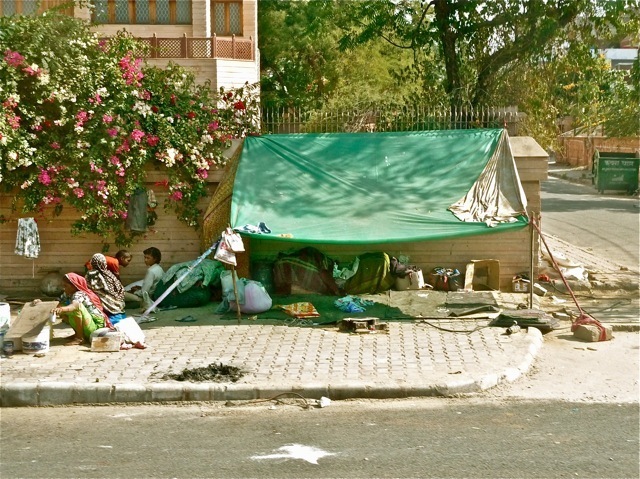 Poor families would live under lean-tos on sidewalks outside comfortable homes. 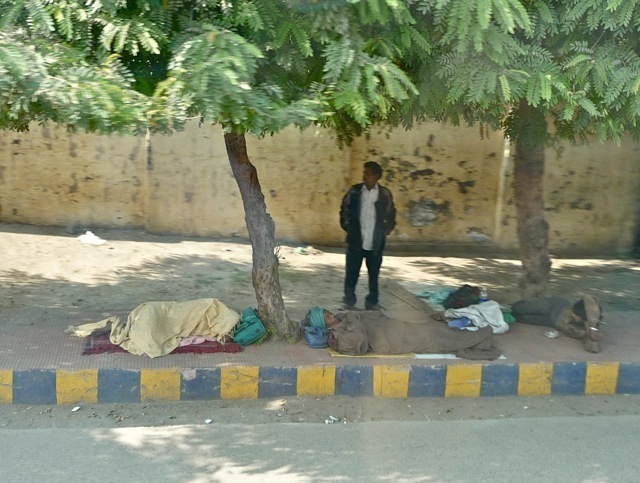 Single homeless men would simply sleep on the sidewalk. 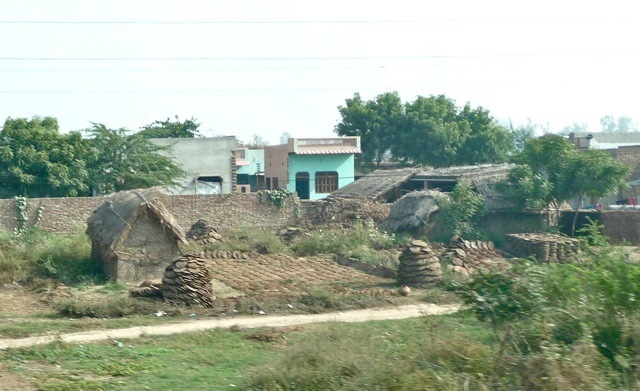 Northern India gets cold in the winter months, dropping down into the 40s degreeF. These homeless people suffer great hardship. Some middle class homes are comfortable by any standard. 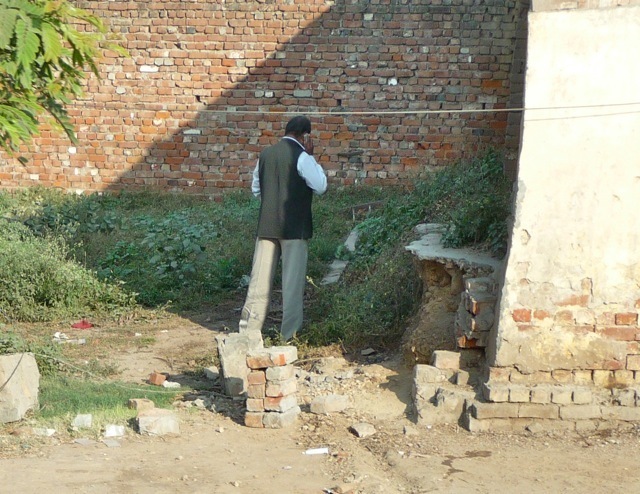 About 50% of Indians have no access to a toilet. They relieve themselves on the sidewalks and fields. That includes both types of bodily needs. This man talked on his cell phone while nonchalantly took care of his body function. The working poor also live a miserable life. One rickshaw man parked his rickshaw and slept on the sidewalk. The other three vehicles were conveyance instruments for the disabled, who were also sleeping on the sidewalk. 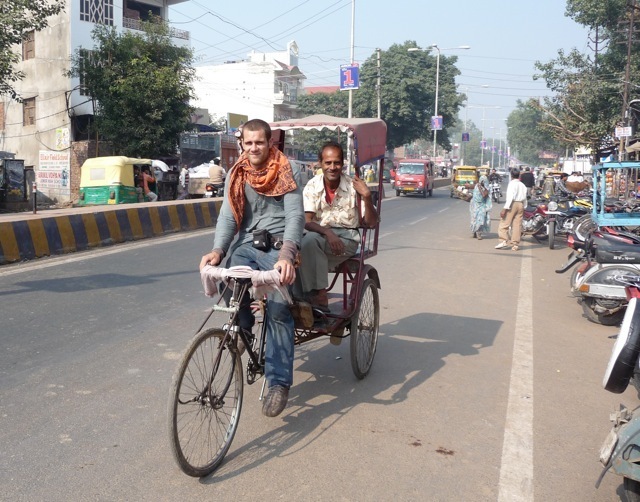 A young Westerner wanted to experience the hardship of pedaling a rickshaw. The Rickshaw man did not seem to mind being paid to ride his own vehicle. 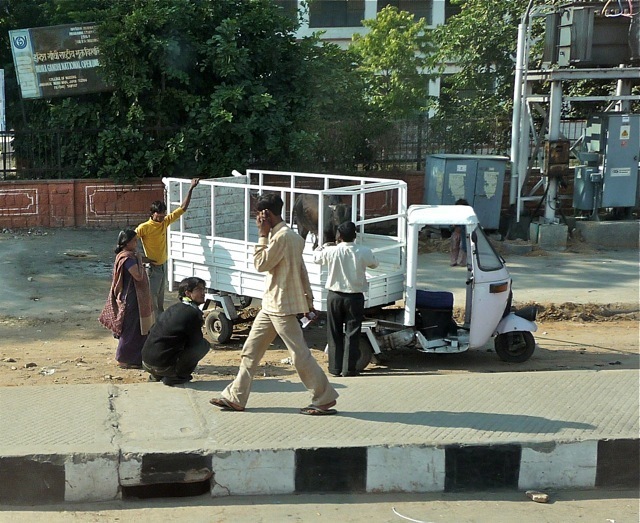 Indian roads are crowded with rickshaws and tuktuks and they are often overloaded. This tuktuk was way overloaded with three passengers riding on its roof. 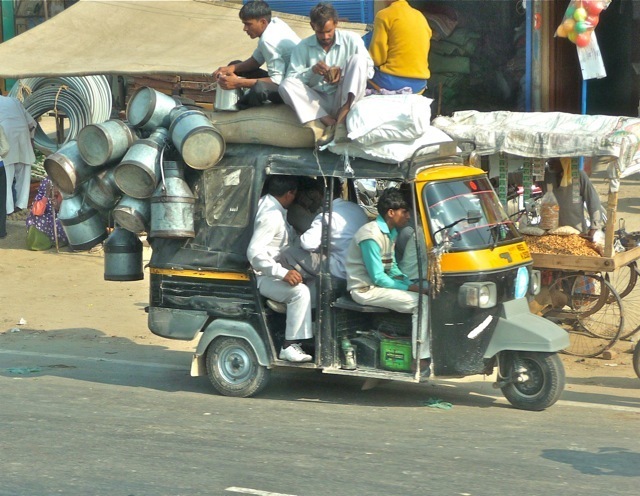 To reduce air pollution, tuktuks were converted to run on compressed natural gas. 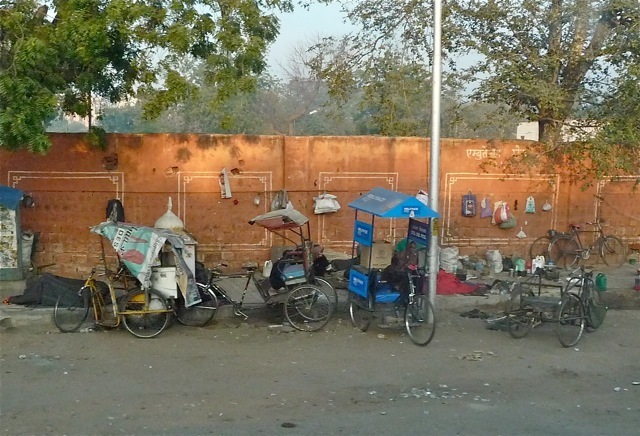 But the city of Agra had only one CNG pump, and dozens of tuktuks lined up to get filled. In the foreground, cow pies from the many cows were drying in the sun. Cow pies are valuable fuel for cooking and warmth. Dried cow pies were neatly stacked up, and were stored in thatched huts. An advancement based on the ubiquitous tuktuk was this semi-trailer tuktuk. It got the attention of curious people. 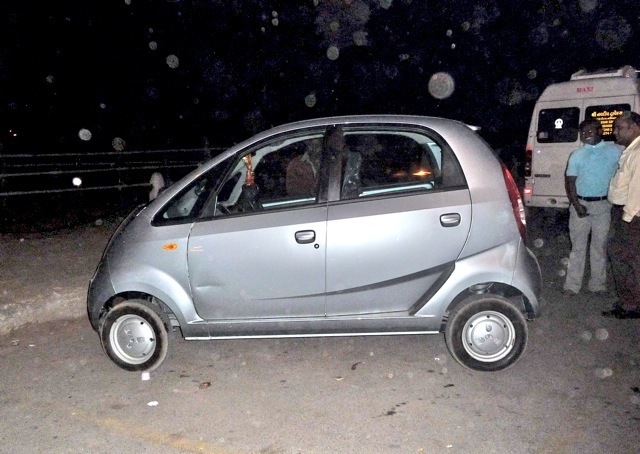 Tata Corporation made news in producing the Tata Nano, sold for US$2,000. This four door sedan carried a family in relative comfort. The driver apparently was a new driver, putting scrape marks on this brand new car. 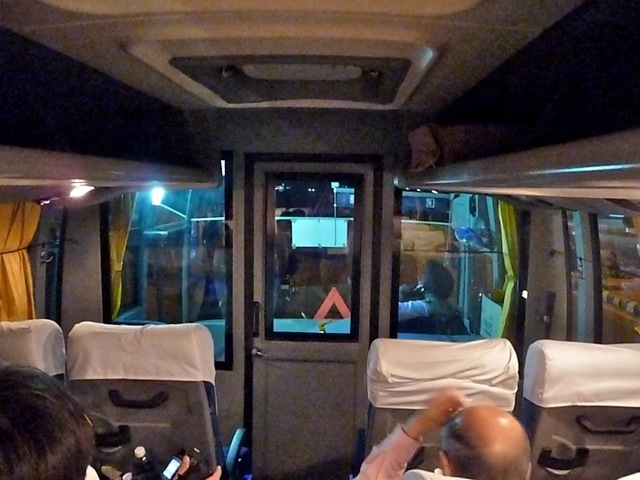 Indian tourist buses have air conditioned compartment for the passengers, and leave the driver to suffer 100 degreeF heat without air conditioning. We chanced upon an Indian wedding. 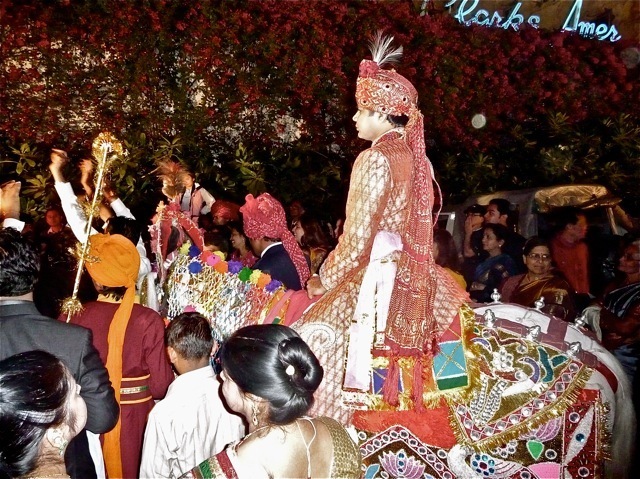 The groom rode a elaborately decorated white horse to fetch his bride. His friends drank into stupor and danced exuberantly to the hot drum beat of the accompanying drummers. Indian weddings last for days. This wedding had a spread on the hotel lawn to serve hundreds of guests. Everybody had a good time, specially the groom’s drunken friends. Fireworks were shot, and loud music played into the night. Posted by Robert Wu on Friday, December 11, 2009, at 12:54 am. Filed under Uncategorized. Follow any responses to this post with its comments RSS feed. You can post a comment or trackback from your blog.